Some sad news: my trusty old computer, on which I wrote Phoenix, died a couple of weeks ago. So I haven't been able to update this blog for a while. 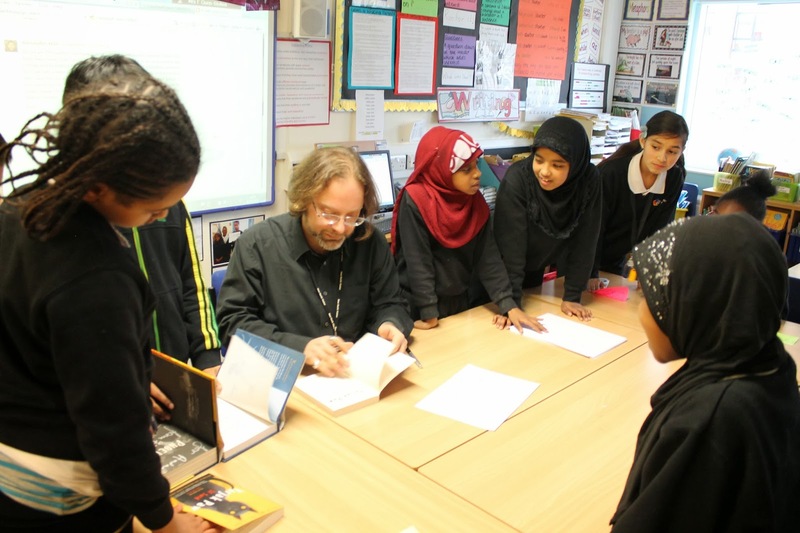 But I've been busy doing school visits, and I hope to make blogs about them all in the coming week. I think my visit to the New North Academy in Islington was one of the best I've ever had. I met some brilliant readers and writers from Year 6, and fantastic teachers like Fiona Gunn-Stokes and Alexander Hall. They showed me the excellent work they'd been doing on Phoenix as well as Varjak Paw. It was really inspiring to see all the enthusiasm for books out there! It really means a lot for a writer to hear things like that! 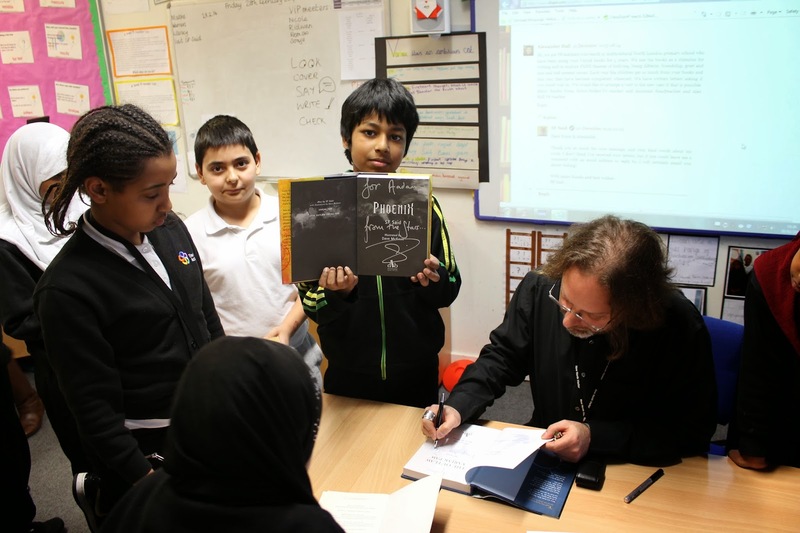 So I'd like to wish everyone at New North Academy all the best with their writing and their reading – and thank you for saying such nice things about my books! The thing that inspired me was you talked to us that you had 91 rejections but you stile wrote books you talked to us about to never give up . Thank you for your great comment! I'm glad you found the visit inspiring. I really do believe that perseverance is the most important quality in doing anything - so whatever you want to do, keep trying to improve and never give up! Thank you for your fantastic welcome, Dalia, and for all your kind words! Good luck following your dreams! That is amazing to hear - thank you so much, Mohamed! Good luck with your Maths, English, Science - and everything else that you do! Thank you, Dalia - that is a brilliant thing to hear, and really means a lot to me. Good luck again! Thank you so much for your lovely comment, Shanice - I hope you enjoy reading Varjak Paw! Hi. My name is Sonya and I was one of the first people to meet you when you came to New North Academy. I would like to thank you for visiting our school and also thank you for inspiring me to write a scfi story. To be honest I wasn't a big fan of science fiction but because of Phoenix I enjoy reading scfi. I'm looking forward to your new book Tyger and I'm sure it's going to be amazing as all your other books. Hi Sonya, thank you so much for that amazing comment! I'm really glad you enjoyed Phoenix, and that it inspired you to read & write sci-fi. There are lots of fantastic sci-fi books out there; I hope you'll enjoy discovering them... And I hope you'll enjoy TYGER too, when it's finished! PS: Thanks again for the fantastic welcome, it was so brilliant to meet you all! Hello SF, my name is Ali and in school (Not new north academy) my class love your books we've been reading varjak paw and the outlaw varjak paw. Everyone in my class is asking if your releasing a new varjak paw book so please tell me. It was so inspiring when you came because a writer has to keep going and even if you get rejected a few times. To say the true I would of gave up on my first time writing a story. Hello Ali, thank you for your comment! I will write a third Varjak Paw book one day; I wrote a bit about my idea for it here. In the meantime, I hope you'll try my new book Phoenix. It's not a Varjak Paw book, but I hope that if you enjoyed Varjak, you'll enjoy it too; many of the underlying themes are similar! Hi Sarah, thank you so much for your kind comment! Perseverance can definitely take you a long way, so whatever you want to do, I think it's really important to keep going and not give up! Hi it's Sonya again. Just to to let you know before the holiday we wrote our own science fiction inspired by Phoenix. Like I previously mentioned I wasn't a fan of science fiction but I ended up getting a Level 5 for writing one. So thank you so much for inspiring me. Hi Sonya! Thanks for letting me know, that is FANTASTIC! Congratulations!!! Hi! I was a Year 3 student in 2014, when you came to our school. I really wanted to meet you, seeing as I had read your first novel a couple of years earlier. I'm actually trying to write my first book as we speak: It isn't really going to plan, but 91 times!?!?!?!?!? That is 90 too many times. I think you are a amazing writer. Thank you so much for your comment, and your kind words! To be fair, those 90 rejections were across 3 books - my first one was rejected 40 times, as was my second, and Varjak Paw was then rejected 10 times before I finally found a publisher! So I think perseverance definitely pays off. It's brilliant to hear that you're writing your first book right now - good luck with it! If it's helpful, I've done a few writing tips on this blog - you can find them all here.